Sometimes a leader is not the one at the head of the line. It’s not the bully who leads the gang to victimize a kid, it’s the one who steps in and stops it that is the hero. 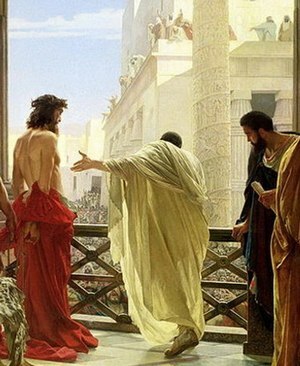 Pontius Pilate, in his day, was a “leader.” But when it came time to set Jesus free, he succumbed to the mob, and sent Jesus to the cross. He didn’t lead, he followed. Martin Luther found truth for himself. While he was a monk, he wrote the 95 Theses and posted it on the church door. (This was a custom at the time to inspire conversation and debate.) But his paper was not merely a conversation piece like knick-knack. It was the Manifesto of a revolution within the church. Jesus Himself showed this different kind of leadership. When he arrived on the scene, the Jewish people were expecting the Messiah to rise up and lead the rebellion against Rome. Jesus instead laid down His life for us, and chose the way of the cross. Many times, the person who goes against the crowd is lied about, called names, subjected to punishments, and generally pushed outside of society. Lord, please give us the strength and courage to be a different kind of hero. Our mission, should we choose to accept it.